comment Enjoy a splash-filled day of interactive fun with your open-dated ticket, valid for 6 months from purchase date. LEGO Wave Pool with over half a million gallons of water! The LEGOLAND® Dubai Water Park One Day Ticket is perfect for families looking for flexibility during their stay in Dubai. This open-dated ticket can be used anytime within six months from purchase date so you can choose the best day to splash into a to enjoy a world of LEGO adventures! With over 20 LEGO® themed water slides and attractions - including both family and DUPLO® Wave Pools, raft, body and tube slides - there is something for everyone! LEGOLAND® Dubai Water Park is the region's only water park designed for familiies with kids aged 2-12. It's where awesome awaits! LEGO® Wave Pool - Catch a gentle wave or simply cool off in this LEGO® themed wave pool where the waves are just big enough for the whole family to enjoy. Build-A-Raft River - Who can build the biggest, best LEGO® raft? You can! Imagine, design and build your own unique LEGO vessel and float around the lazy river. DUPLO® Splash Safari - Toddlers will love this water play area with four “toddler sized” slides and larger than life LEGO® DUPLO® characters. Twin Chasers - Race each other on these double body slides shooting you into a wading area below... who will reach the bottom first? Wave Rider - Zoom your way down in this open body slide straight into the water below. Joker Soaker - A fun, interactive playground with slides offering something for every family member. Wade in the pool or enjoy a torrential downpour from a 300-gallon guaranteed to soak anyone in its path. Splash Out - Speed down the 60-foot drop of this open body slide and ‘splash out’ into the water below. Red Rush - The whole family can ride together in a family-sized raft down a 312-foot-long curving track on an 11-foot in diameter half pipe. LEGO® Slide Racers - This exhilarating ride consists of six mat slides where you can race against your friends. But be warned, it sure is wet and wild! Twist ‘N’ Spin - Spin down the slide on your own - or with a friend - on this double tube and enjoy endless twists and turns. The LEGOLAND® Dubai Water Park One Day Ticket is open-dated and MUST be used within six months from purchase date. You will receive a gate-ready LEGOLAND® Dubai Water Park One Day E-Ticket that must be printed on receipt. Upon arrival, simply scan the barcode at the gate for fast track admission to the parks. This ticket gives you 1 (one) day admission to LEGOLAND® Water Park ONLY. Unless otherwise stated, tickets are not valid for separately ticketed events, performances or activities at LEGOLAND® Water Park or elsewhere within Dubai Parks & Resorts. All guests entering LEGOLAND® Water Park are subject to the rules and regulations of entry as displayed at the main entrance and within Guest Services. LEGOLAND® Water Park, in its absolute discretion, reserves the right to vary the opening and closing dates and times of the attractions and to close, remove or cancel all or any part of the rides, events or facilities within the attractions for any reason including, but not being limited to technical, health and safety and/or operational reasons or due to special events or private functions. You will be emailed a gate-ready E-ticket that must be printed on receipt. Upon arrival, simply scan the barcode at the gate for admission to the parks. Can I visit the other Dubai Parks and Resorts attractions with a LEGOLAND® Water Park 1 Day Anytime Ticket ? LEGOLAND® Dubai, MOTIONGATE™ Dubai and Bollywood Parks™ Dubai all require their own admission ticket. 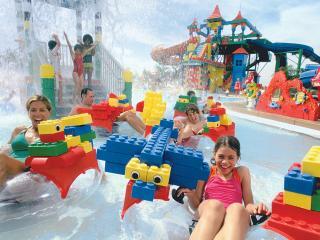 Do children below 3 years require an admission ticket to visit LEGOLAND® Water Park? There is a minimal fee for children under 3, which includes swimming diapers. This is paid locally. Is LEGOLAND® Water Park open all year round? Yes, LEGOLAND Dubai and LEGOLAND Water Park are open 365 days per year. Does LEGOLAND® look after my kids while we are in the park? LEGOLAND® is the perfect place for a day out with the family. The whole park is family friendly and most rides can be enjoyed by the children and their parents together. The park does not offer services to look after children. What type of restaurants are there? There are numerous dining options from kiosks to buffets offering a variety family friendly menu items. Indoor and outdoor seating are available at the majority of our restaurants.